Categories: Divine Names, Spirituality, Sri Swamiji's Kirtans, Uncategorized. 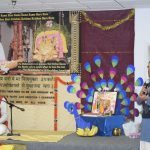 A two day satsang event was conducted in Sri Hanuman Mandir on April 28th and 29th 2012 in Atlanta, Georgia. The program started with a truly wonderful Bhajan session performed by GOD Atlanta’s Gopakuteeram kids. The session concluded with the rendition of Sri Swamiji’s kirtan “Jaya Jaya Radhe, Jaya Jaya Sitae”. Sri Poornimaji distributed certificates and gifts to all the kids who participated in the event. This was then followed by Poornimaji’s impactful lecture on “Bhakti Yoga – The Ultimate Path to Perfection”. 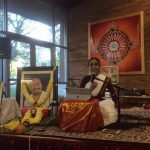 Interspersing her talk with beautiful kirtans composed by Sant Kabirdas and Goswami Tulasidas, she delineated the path of Bhakti in a very simple and lucid language, quoting references from Srimad Bhagavatham and Srimad Ramayanam. The discourse was also studded with various anecdotes and blissful experiences with Sri Swamiji. The satsang concluded with a three minute Mahamantra prayer session. 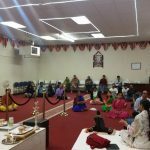 The temple priest honored Poornimaji with Mahaprasad and expressed his eagerness in organizing a Bhagavatha Sapthaham during Poornimaji’s next Atlanta trip. About eighty devotees attended the satsang every day. 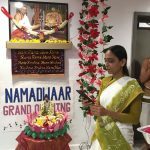 The entire program was possible by the energy and enthusiasm of Sri Swamiji’s ardent devotees in Atlanta and their initiative is the prime reason for God Satsangs in the Atlanta area.